A retelling of the popular Rapunzel story, with a signature Disney twist. Made for fans of Disney animation, and people that just want a good time at the movies. Last year Disney returned to its hand drawn animation roots with Princess and the Frog which was a welcome respite from the glut of CG animated films that have invaded theaters ever since Toy Story introduced us to the medium. Disney also ventured into it’s own CG animation without the help of Pixar’s name behind it with the movie Bolt, which ended up being a big hit with adults and kids. With Disney’s new movie tangled, they have taken the animation style of Bolt, but have kept the same musical style of the original hand drawn animated features that we know so well. Tangled is the story of Rapunzel, how she got locked in the tower, and how she is eventually rescued by a strapping young man. Sure, Disney takes liberties with the original story, but that’s to be expected. Rapunzel is voiced by Mandy Moore. When she sings her first song it sounds almost exactly like the type of bubble-gum-pop that Miley Cyrus sings. After hearing this first musical number I was frightened that this movie may venture into the pop-star territory. More like a cartoon for the Disney channel, than one for the big screen. Fortunately, as the movie progresses, the musical numbers become more Disney-like in flavor and feel. Rapunzel has been locked away in a tower by her evil mother, because her hair has magical powers that if touched can keep a person young. We learn from the beginning of the story that Rapunzel was actually born as a princess to the king and queen of the land, but after learning of her hair’s power, an evil woman stole her and pretended to be her mother in order to keep herself youthful. Flynn Rider is the scoundrel of the kingdom. He steals, pillages, and plunders, but always does it with a smile on his face. He’s one of those typical Disney heroes, with a cocky attitude and a biting sense of humor. Soon Flynn and Rapunzel meet, when Flynn is trying to escape the kingdom’s guards. Rapunzel bribes Flynn in order to take her out to see the world she’s been missing all these years. He does, and a colorful adventure ensues complete with the requisite human-like animal sidekicks (a cute little chameleon and a hard-headed horse). Enough about the plot, as parents, what you really want to know is that not only is the movie fit to take your children to, but you also want to know if you’ll end up falling asleep in it. This is actually a problem with a lot of kids films nowadays. They’re made for kids, which gives parents headaches when they have to watch the same childish movie for the twentieth time. Rest assured that not only will Tangled keep your kids happy and occupied, but you’ll find yourself invested in the story and its delightful characters. It has a quality about it that transports you back to Disney films of old like Snow White and The Little Mermaid. 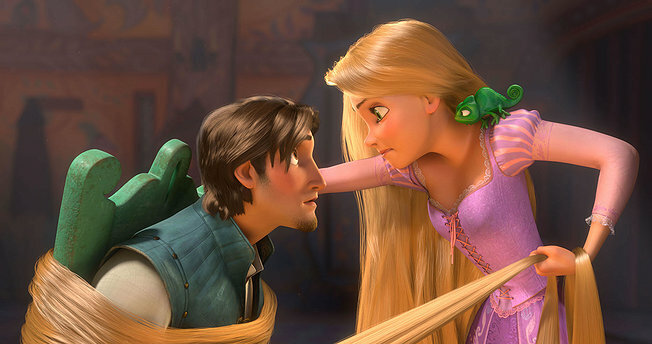 In short Tangled is a great family movie for this upcoming holiday weekend.